Do you find regular brewery tours too predictable? To you, does a beer taste better when it's earned? 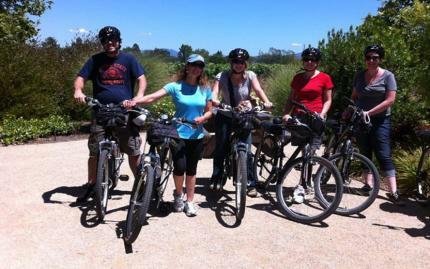 Well on this Bike'n Brew tour you'll earn Two to three breweries worth! You will start your journey Downtown Santa Rosa beside the paved nature trail. As you venture on the trail, take a gander of the artistic murals, mosaic tiles and cobblestone walls that you will leisurely cycle through. Just know, as you cycle down the beautiful trails and country roads of Sonoma County, there will be beer waiting for you on the other end of the hills. As you sip the craftiest beers in Northern California, you will also learn about the history of brewing, and meet the locals at their localist. So hop on your bike, and onto the only trail in California that leads to well earned beer. Note: The following is included in the price of this booking: 4 sampler tastings at first brewery, bike, helmet, handlebar bag, gear rack, and lock. Please provide the heights of all of your riders in the "Special Requests" section when placing your booking so that the appropriate sized bikes will be provided.